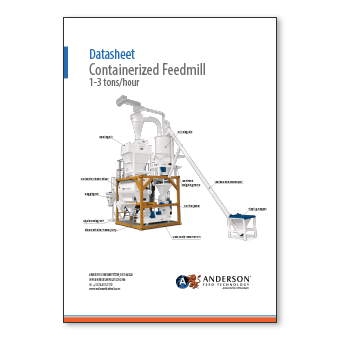 Containerized systems are a unique, high-tech and efficient concept developed by Anderson Feed Technology. A modular design with all the necessary feed mill equipment, electrical installation and process control equipment. The main components of the installation are installed and tested at our factory in the Netherlands and require a minimal installation time on site. Anderson Feed Technology. offers the small containerized C3 series for up to 3 tons per hour. The C3 series can be extended into a C3-2. The C3-2 produces 2 tons pellets and 1 ton mash feed per hour. Small modular solutions are built into a 10 ft. or 20 ft. container frame. The container frame also serves as a supporting structure and is easy to install in areas with limited space. 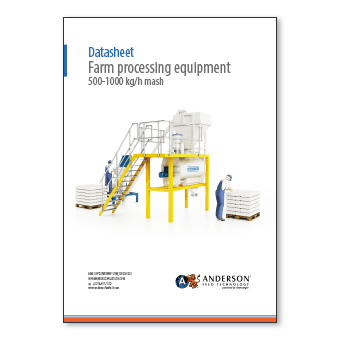 Specialized for small feed producers, Anderson Feed Technology. developed small farm processing solutions. The equipment is suitable for the production of feed up to 1100 lbs/h or 2200 lbs/h. The installation includes all essential process machinery from the intake, grinding and mixing into a manual bagging system.